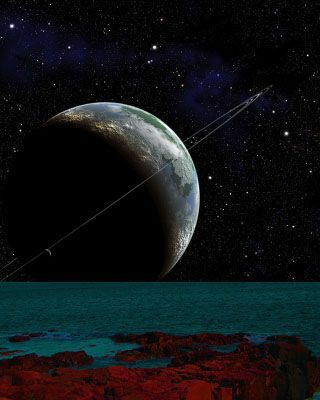 This artist's conception shows a hypothetical ringed super-Earth as viewed from one of its moons. Both super-Earth and moon are habitable and contain liquid water. Although our telescopes will likely become good enough to detectsigns of life on exoplanets within the next 100 years, it would probably takemany centuries before we could ever get a good look at the aliens. "Unfortunately, we are perhaps as far away from seeingaliens with our own eyes as Epicurus was from seeing the first other worldswhen, 23 centuries ago, he predicted the existence of these planets," said astrobiologist Jean Schneiderat the Paris Observatory at Meudon. He and his colleagues discussed the difficulties of studyingdistant alien life in the journal Astrobiology. Schneiderand his colleagues say that in the next 15 to 25years, there will likely be two generations of space missions able to analyzeexoplanets in greater detail. The first generation will feature1.5-to-2.5-meter-wide coronagraphs to block out the direct light from a star tohelp search for giant planets and nearby super-Earths. The second generation will feature interferometers, coronagraphsand other equipment to better analyze the light reflected off these exoplanets.These missions could reveal what the planets might look like, and what theymight have in their atmospheres or on their surfaces. At the same time, therewill likely be coronagraphic cameras on extremely largeground-based telescopes. After these projects, future missions could search for morepotentially habitable planets either by peering at more distant stars more than50 parsecs away or at rockymoons of giant planets seen in the habitable zones of nearby stars. The follow-up missions also could deeply investigate anyexoplanets that display potential signs of life. Such missions will requiremuch larger arrays in space — for instance, taking a 100-pixel image of aplanet twice the width of Earth some 16.3 light years away would require theelements making up a space telescope array to be more than 43 miles apart. Such pictures of exoplanets could make out details such as clouds,rings, oceans, continents, and perhaps even hints of forests or savannahs.Long-term monitoring could reveal seasonal shifts, volcanic events, and changesin cloud cover. One might even detect the presence of moons by shadows theyproject on the planets. More sensitive instruments could hunt for thewavelengths of infrared light associated with carbon dioxide, which could tella lot about the atmosphere. Beyond conventional signs of life as we know it, such as oxygen inatmospheres, another type of signal could be "technosignatures,"features that cannot be explained simply by complex organic chemistry. Technosignaturescould include laser light, chlorofluorocarbon gases, or even artificialconstructions. "Looking for aliens is philosophically important — it wouldtell us what is essential in the human condition," Schneider said. However, if scientists actually detect signs of life, it willfrustratingly take many centuries before humanity can realize the hope ofseeing what these aliens might actually look like, Schneider and his colleaguesexplained. "It is very disappointing," Schneider said. To begin imaging even giant organisms 30 feet long and wide on theclosest putative exoplanet, Alpha Centauri AB b, some 4.37 light years away,the elements making up a telescope array would have to cover a distance roughly400,000 miles wide,or almost the sun's radius. Thearea required to collect even one photon a year in light reflected off such aplanet is some 60 miles wide. To determine if thelifeform is moving with a speed of even 2 feet per minute ? and that the motionyou?re seeing is not due to errors in observation ? the area required tocollect the needed photons would need to be some 1.8 million miles wide. The only alternative would be to dispatch spacecraft out to theplanet, but such a journey would be long and perilous. At speeds of 30 percentthe speed of light, a 100-micron-thick interstellar grain roughly the width ofa human hair would pack roughly as much kinetic energy as a 100-ton bodytraveling 60 miles per hour. No currently available technology could protect against such athreat without a spacecraft massing hundreds of tons, which in turn would beextraordinarily difficult to accelerate up to high speeds. One could insteadtravel more slowly and thus more safely, but at even 1 percent the speed oflight (or about 1,860 miles per second) it would take millennia for thespacecraft to reach its target destination. Regardless of the approach, it seems it will take centuries to getdirect visual contact with any nearby aliens, at least in the framework of thescience and technology we have now. What physics we might have in a millenniumis not reasonable to anticipate, the researchers said. "I hope that there will be an unpredictable revolution in physicalconcepts," Schneider quipped. Not everyone found these prospects disappointing. "Wehave always been planning on detecting life indirectly, by searching foratmospheric signatures of life, most likely of the single-cell variety,"said astrobiologistAlan Boss at the Carnegie Institution of Washington, who did not take partin this study. "Thatis what we have been hoping for, and we are still a long way from being able toachieve even that modest goal. We will be overjoyed when we are able toaccomplish that goal — it is a race with our planetary colleagues to see ifthey can find evidence for life on Mars before we find evidence for lifeoutside the solar system!" Ofcourse, there?s always a chance we?ll get to study aliens close-up if they comeseeking us, rather than the other way around. According to Boss, however, thatis an unlikely event. "Wedo not need to worry about aliens coming to Earth to enslave us ? interstellartravel by living creatures is science fiction, not science fact," he said. "No one needs to worry at night about the interstellar air raid sirensgoing off."